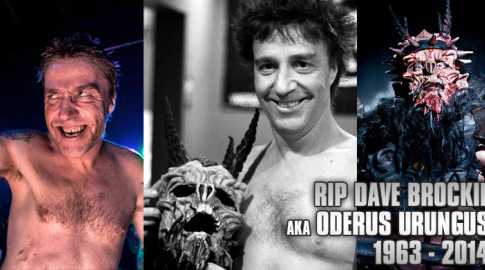 Sunday marked a great loss in the world of music and art with the passing of Dave Brockie, the savagely creative and one-of-a kind Scumdog of the Universe best known as Oderus Urungus of Gwar. The music and universe that he created were unlike anything else the music industry has ever known, and he’ll be missed by many across the world. It was during our show at Balliceaux in Richmond, VA, that we noticed something was amiss. The promoter of our show and former bandmate/close friend of Dave’s, Chris Bopst, had disappeared during our set and returned with a grim look on his face, heart heavy with the tragic news. We found out right there, where we had met Dave only months earlier on his 50th birthday, that he was indeed no longer among us. That night was truly a memorable one in the journeys of the Dirty Bourbon River Show! It was after a show months ago that we were introduced to Dave, and the experience has always stuck with us. Meeting the man behind the mask was almost unreal, but then you noticed the eyes and the voice… The man had a wild electricity behind his eyes that told of a sharp mind and expansive imagination with a motivation that could fuel an intergalactic spaceship full of warmongering space mutants. After hearing our set, Oderus spent the next hours scheming to construct a band starring a greedy New Orleans vampire – complete with a luxury coffin and weird entourage – that could melt the minds of all who gazed upon him. The man’s imagination knew no bounds, and we were hoping to get another chance to spin crazy stories together this past weekend, but alas. All we can say is that it was an amazing experience and a great honor to hang with him for the very brief time we got. Dave had been an integral member of Gwar since its inception in 1984 and helped see it through its mission to rock the boat in the world of music and entertainment ever since. From taking part in spectacular live shows rife with top-notch musicianship and narrative songwriting to priceless interviews on the Jerry Springer show and dramatic readings of ‘Goodnight Moon,’ Dave/Oderus helped to shock and inspire the world with Gwar’s antics. Over their time together, the band has toured the world, been nominated for 2 Grammy awards, delivered numerous standard and long-form music videos, and released 13 studio albums. Regardless of your musical taste, you have feel just a little inspired by the amount this crew has accomplished over the past three decades. For a sampling of some of Gwar’s finest moments over the years, click the link HERE. From our heart of hearts, we here at the Dirty Bourbon River Show want to express our deepest condolences to Dave’s family, friends, bandmates, and fans for their loss and our gratitude for the brief but inspiring opportunity to have been able to meet and scheme with him and for Dave’s unique contributions to the creative world. Remember: Scumdogs of the Universe never die!